Ginger is native to India and China. It takes its name from the Sanskrit word stringa-vera, which means "with a body like a horn" from its antler-like appearance. 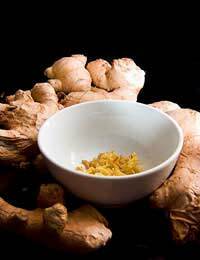 Ginger has been important in Chinese medicine for many centuries, and is mentioned in the writings of Confucius. It is also named in the Koran, the sacred book of the Moslems, indicating it was known in Arab countries as far back as 650 A.D. It was one of the earliest spices introduced to Western Europe, where it has been used since the ninth century. It became so popular in Europe that at one time it was included in every table setting, like salt and pepper. A common article of medieval and Renaissance trade, it was one of the spices used against the plague. In English pubs and taverns in the nineteenth century, barkeepers put out small containers of ground ginger, for people to sprinkle into their beer -the origin of ginger ale. How Does Ginger Work in The Digestive System? It helps protect the gastric system by increasing the pH of stomach acid, reducing its acidity, thereby lower the rate of gastric secretions, and increasing digestive enzyme activity. Rather than blocking the feelings of nausea in the brain, it acts directly on the stomach and liver to reduce nausea and vomiting. It is also said to speed up the metabolism thus help to burn fat. Chillies - chilli peppers provide three times more vitamin C than oranges. Moderate amounts of fresh or dried chillies will induce the body to sweat - a cooling mechanism which could explain the popularity of chillies in hot climates. The heat comes from a component called capsaicin, which is concentrated in the white ribs and seeds. Capsaicin can relive nerve pain and is sometimes used in a cream to ease the pain of shingles. Herbalists advocate the consumption of chillies to warm the body, improve circulation and stimulate the metabolism. Turmeric - contains compounds that herbalists use to treat and prevent conditions of the liver such as hepatitis, cirrhosis and jaundice. It calms the digestive system and stimulates the gall bladder to release bile (aiding the breakdown of fats). Added to beans and pulses it can help to reduce gas and bloating. Curcumin, an active component, is thought to have anti-tumour effects. Cinnamon - Several compounds isolated from cinnamon may one day become the key natural ingredients in a new generation of products aimed at lowering blood sugar levels. The extracted compounds increase insulin sensitivity by activating key enzymes that stimulate insulin receptors, while inhibiting enzymes that deactivate the receptors. The compounds also have antioxidant effects, which may provide synergistic benefits to people with various forms of diabetes.